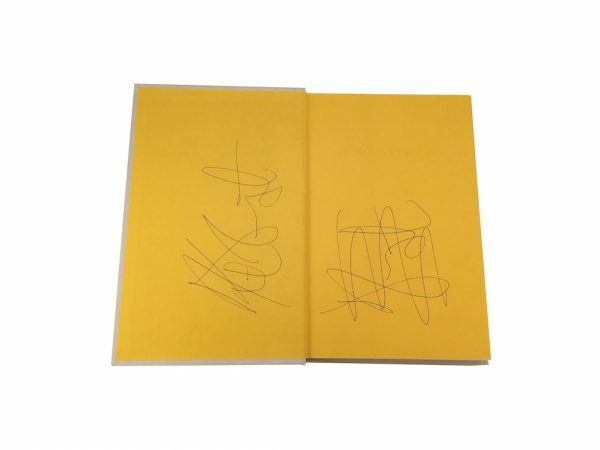 Comments: Signature on inside cover and FFEP. 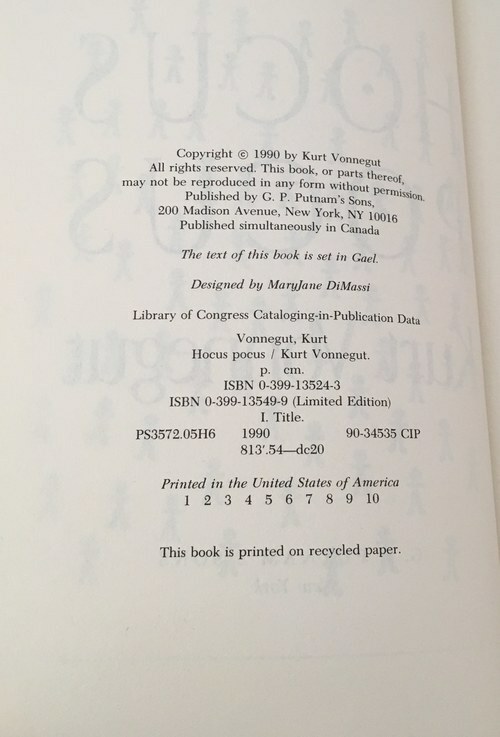 Synopsis: Eugene Debs Hartke (named after the famous early 20th century Socialist working class leader) describes an odyssey from college professor to prison inmate to prison warden back again to prisoner in another of Vonnegut’s bitter satirical explorations of how and where (and why) the American dream begins to die. 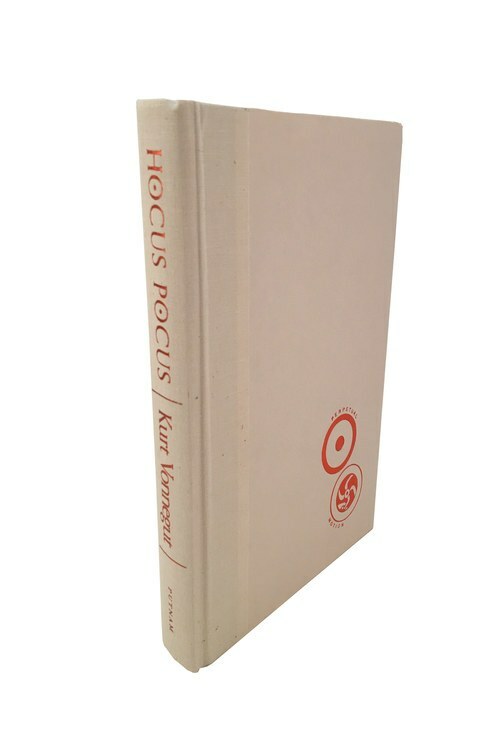 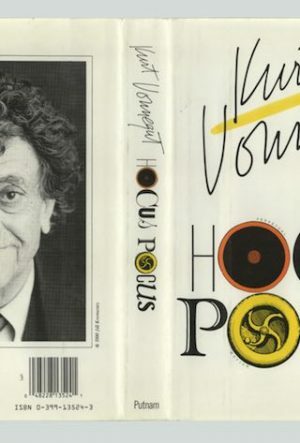 Employing his characteristic narrative device―a retrospective diary in which the protagonist retraces his life at its end, a desperate and disconnected series of events here in Hocus Pocus show Vonnegut with his mask off and his rhetorical devices unshielded. Debs (and Vonnegut) see academia just as imprisoning as the corrupt penal system and they regard politics as the furnishing and marketing of lies. 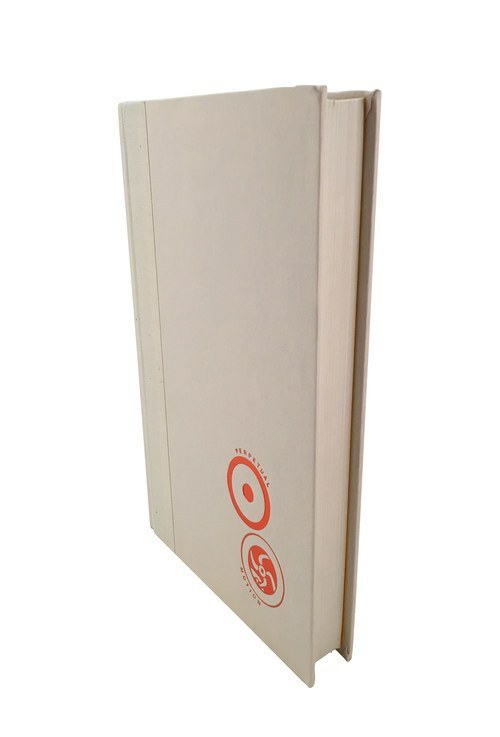 Debs, already disillusioned by circumstance, quickly tracks his way toward resignation and then fury. 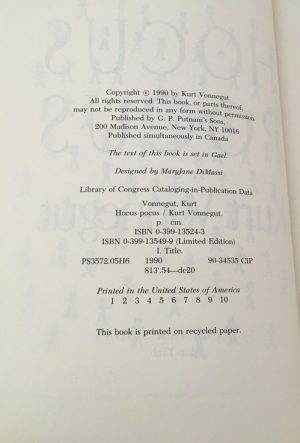 As warden and prisoner, Debs (and the listener) come to understand that the roles are interchangeable; as a professor jailed for “radical” statements in the classroom reported by a reactionary student, he comes to see the folly of all regulation. 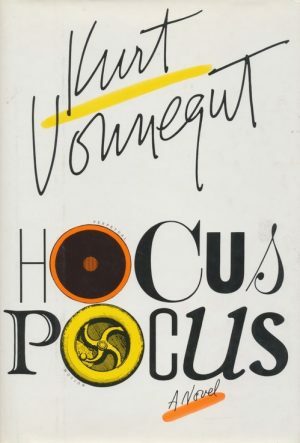 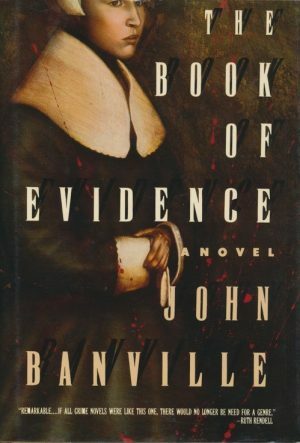 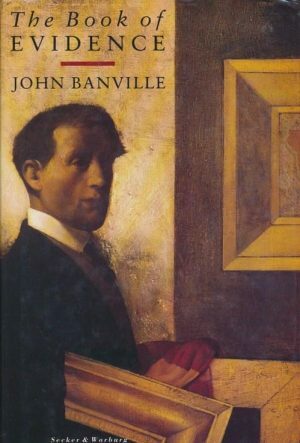 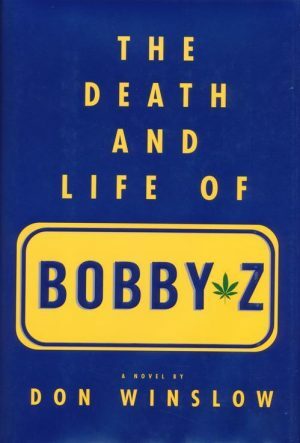 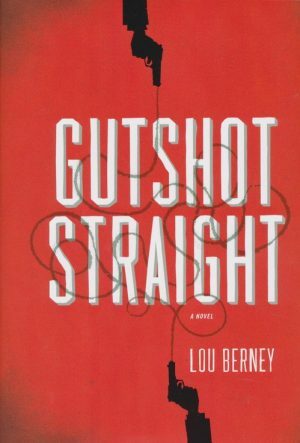 The “hocus pocus” of the novel’s title does not describe only the jolting reversals and seemingly motiveless circumstance which attend Debs’ disillusion and suffering, but also describe the political, social, and economic system of a country built upon can’t, and upon the franchising of lies. 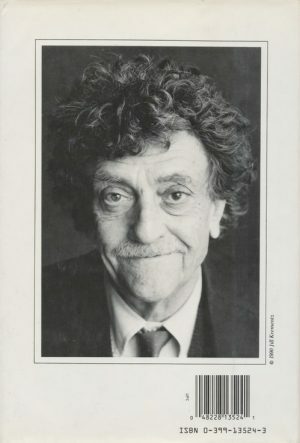 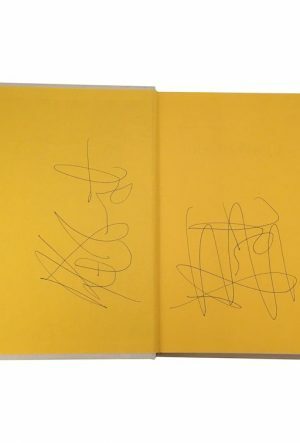 At 68, Vonnegut had not only abandoned the sentiment and cracked optimism manifest in Slaughterhouse-Five, he had abandoned any belief in the system or faith for its recovery. 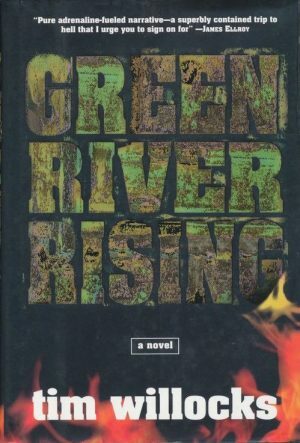 This novel is another in a long series of farewells to the farmland funeral rites of childhood.